In order for President Trump to have any success at draining the swamp, he will need more like-minded patriots in Congress. The current Senator from Alabama, Luther Strange, is despised by both Trump supporters and the conservative grassroots. He has a well-deserved reputation for being corrupt and is considered by many to be nothing more than a puppet of Senate Majority Leader Mitch McConnell, R-Ky.
And he is, of course, being challenged by Judge Roy Moore, who is known for being a man of honor and integrity. Despite being outspent 10 to 1 in this race, Judge Moore has consistently held a double digit lead in virtually every poll, and he has also been strongly supported by Breitbart, the most influential political site on the planet. Tuesday, September 19 is Judge Roy Moore Day in our Tea Party group, which can be seen here. Every single post, meme, comment, or article that anyone posts in our group between 4 to 11 pm EST that either supports Judge Moore or criticizes Luther Strange will be approved. No posts of any other type will be allowed on our floor during that time. Help us stand with Roy and strike a blow to the corrupt establishment! Donald Trump has been a tremendous blessing to this country. America is a much better place because he was elected as our president. But he can’t do this alone. Judge Roy Moore is a man of honor and integrity, and he will fight side by side with our president in order to Make America Great Again. 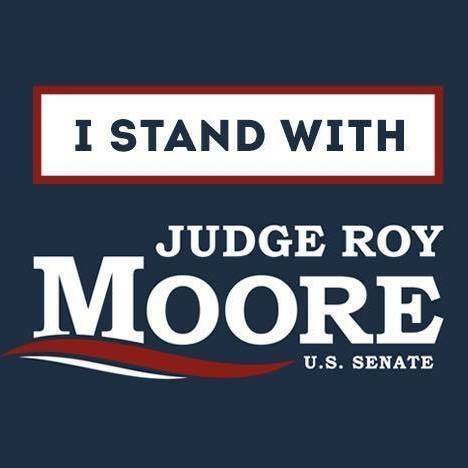 Go check out his campaign page and you will see why Roy will once again give the great state of Alabama a Senator they can be proud of.